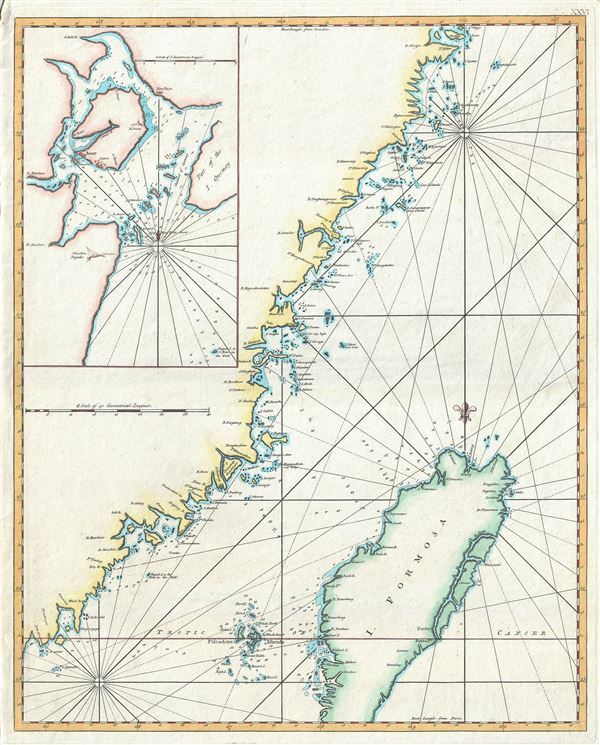 18th century nautical chart of the coast of Taiwan or Formosa. A scarce c.1780 British edition of D'Apres de Mannevillette's nautical chart or map of Taiwan (Formosa) and the mainland Fujian Coast, China. The map offers rich detail including countless depth soundings, notes on the seafloor, commentary on reefs, rhumb lines, shoals, place names and a wealth of other practical information for the mariner. The basic cartography of this map dates to Mannevillette's voyages as pilot for the Compagnie des Indies in the early 1700s : Carte de la coste orientale de la Chine depuis Amoy, jusqu'a Chusan avec une partie de l'Isle Formose. His work was originally published in Paris in the 1745 Neptune Oriental and republished in 1775 in an expanded second edition. The present example has been updated and re-engraved for an English client base. New additions include the incorporation of 'Longitude from London' and the removal of the French title. There is an inset map of Amoy in the upper left quadrant. This may well be the from the 1775 edition, but is most likely published by Laurie and Whittle in their East-India Pilot. Jean-Baptiste d'Après de Mannevillette (February 11, 1707 - March 1, 1780) was a French sailor, navigator, and hydrographer active in the mid-18th century. Mannevillette was born in Le Havre to a family of wealthy seafarers. As a young man he studied mathematics and navigation in Paris before earning his sea legs as a commissioned officer on the merchant vessel Marechel d'Estrees bound for the West Indies. Mannevillette eventually attained the rank of Captain with the Compagnie des Indes. In the course of numerous voyages around Africa to India and China, Mannevillette collected and revised a number of regional nautical charts. His sophisticated use of the most modern instruments, most specifically the Octant or English Quarter, and keen mathematical mind enabled Mannevillette to correct many significant errors common to earlier maps of the region. These updates were eventually compiled and published in Mannevillette's most significant work, the 1745 Neptune Oriental. The Neptune Oriental was well received by navigators and earned him admission into the Academy of Sciences. Eventually he took a position with the French Hydrographic department and in 1775 republished his opus in a greatly expanded format. In 1767 King Louis XV conferred the Order of St. Michael upon him and made him an associate of the Royal Marine Academy. Mannevillette died on March first of 1780 at 75 years of age. Mannevillette, Jean-Baptiste d'Apres de, Le Neptune Oriental, (Paris) 1775. Very good. Original platemark visible. Minor spotting.